Richard has decided to move on from EOTPro. I wish him the best in his new trading adventures! He’s always been a great friend and mentor to me, and I know I’ve needed it. Richard’s departure has opened up a need for a developer at EOTPro. I’m starting to slowly try to fill Richard’s shoes. It’s a tall order, but I’m doing my best. Along with development for EOTPro proper (hence my scarcity here), I’ll be finishing and releasing my automation for Bill’s Arrows over the next month. That way, EOT members will be able to have the indicators from their subscription with EOT, and get automation, including customization of rules and support from me. I still plan on blogging here as my time permits, and in developing for Think or Swim and Ninja separately from EOT as I have in the past. (Of course, their proprietary info shall remain proprietary and will not be shared.) More info to come in the near future! If you haven’t checked EOT out, hit the picture link below! UPDATE: It’s working! I can arm and disarm the strategy from the form. The problem was that I didn’t link up the event handler to my button. Details, details. With this capability, I’ve solved the biggest automation problem. Now in the premarket, you initialize the strategy, F5 the chart to refresh the indicators so they are visually in sync with what the strategy is calculating against, and just leave it alone for the rest of the day. Even though it “works” now, it still needs some more development. I want to try to integrate it into the chart toolbar if I can. Otherwise, the form only comes up when you initialize the strategy, so if you close it, you’re screwed. Plus, it doesn’t go away on it’s own, so I need to make it smart enough to not make a new one if an old one already exists. Also, I need to place all the operational parameters of the strategy on the form instead of just the “armed” switch. That way they can be adjusted without screwing up the saved real-time indicator values. Thanks for your patience, it will be worth it in the end! So I’m still working on the EOT strategy. I’m trying to find a way to be able to stop and start it without erasing the saved data in the chart. EOT members know that you can’t mess with the chart or you’ll lose your volume info since it only works with real time data. If you have to reload the chart data (which you do whenever you change any chart parameters or say switch a strategy on or off) all data from earlier in the day is wiped out. I have a couple of solutions I’m investigating. My work had also been Hell last week with deadlines and computer crashes, and a root canal gone haywire. It’s not been my week. A quick status: I’ve received some guidance from Richard and made some changes. I’ve tested the strategy on lots of simulated data and it looks good. 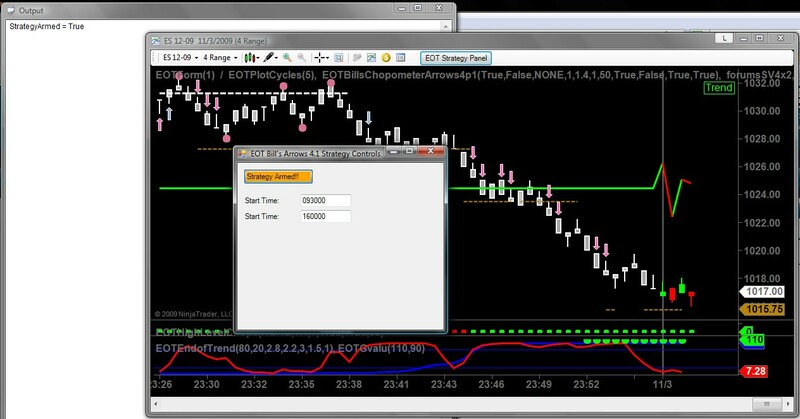 The strategy matches the displayed indicators as long as you refresh your chart (F5) as soon as you apply the strategy. I’ve sent out another update to my beta testers. If all goes well, I can release the first version tomorrow.